The hustle bustle started early morning as the bags were being packed as we were ready to checkout of the Beausite B&B. We discovered that one of my gloves was missing, the lip balm couldn't be found and the comb left on the table the earlier morning was no where to be seen, all in all a very chaotic morning. Having made peace that my bag would have swallowed these things like my washing machine, we had a good breakfast and took the bus to the Interlaken West station. I was in no mood to drag my luggage all the way up to the top of Europe, so we left it in the lockers on the station. 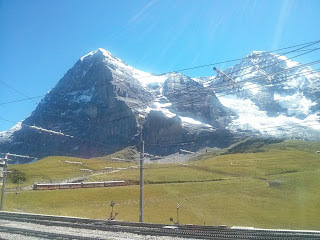 We had some spare time until the next train so I made a suggestion to the husband that we could buy the mountain railway tickets for Jungfrau in advance. When we reached the counter, we were taken aback to find out that all mountain railway tickets from Scheidegg to Jungfraujoch (which is the final leg of the mountain railway) were booked and the first available train booking was at 100 pm. Soon those got sold out too so we quickly reserved the 130 pm train tickets. We later found out though that its not really necessary to book the train in advance because there is a separate line for 'unreserved' travellers which also moves at a descent pace. So in hindsight, it would have been alright to take the chance and just queue up. Anyway, since we had booked specific trains, we now had plenty of time to spare. We walked the complete Interlaken promenade from west to east and as we were walking, we saw a hoard of Indians in the Kursaal garden near the casino. 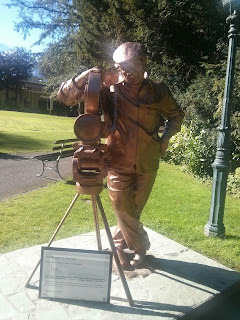 On pursuing my curiosity further, we spotted the Yash Chopra bronze statue. The government of Interlaken has awarded him the honorary title of “Ambassador of Interlaken”, and Jungfrau Railways has named a train after him – an honour shared only with the railway’s founder, Adolf Guyer. In addition, the five-star Victoria Jungfrau Grand Hotel & Spa in Interlaken has a suite named after Yash Chopra. It does not come as a surprise that the Swiss Government has done all this for the man who brought the breath taking Switzerland mountains and valleys to every theatre in India thus boosting the tourism in this area for decades to come. After taking a few photos, we continued our walk towards Interlaken Ost station. The journey from Interlaken to Jungfrau is a long one and you need to change 3 trains - Interlaken to Lauterbrunnen/Grindelwald (you can choose either), then to Klein Scheidegg (KS) & then KS to Jungfraujoch. I recommend you choose one way to go up and the other way to come down, we decided to go up via Lauterbrunnen and come back via Grindelwald. The parents who have been to Switzerland many years ago, even before Yash Chopra boosted its tourism, had suggested that we visit the Trummelbach waterfalls near Lauterbrunnen which was a good decision and an amazing experience. You can visit these falls by small bus ride from Lauterbrunnen. Loud, thundering and roaring in the interior of the mountain - these are the Trummelbach Falls. The Falls carry the melting water of the glaciers from the Jungfrau down to the valley up to 20,000 litres of water per second and its not a surprise that its a UNESCO world heritage site and the world's only glacier waterfalls that are accessible underground by lift, tunnels and platforms. A tunnel elevator takes you up the steep mountain and small lookout and cutouts provides view to ten chutes where the water crashes down at a thundering speed with deafening sounds into foaming milky pools before disappearing into darkness until they come out again through another chute. The freezing spray water has made the caves damp and slippery but you can feel the fresh droplets of pure pristine glacier water as you move chute to chute. Unfortunately, we couldn't take very good photos as it was too dark inside the caves but mostly because I was too scared to go too close to the lookout points. All in all, its definitely worth a visit, a good stop to make on the Jungfrau trip, specially since you have already bought the mountain tickets. 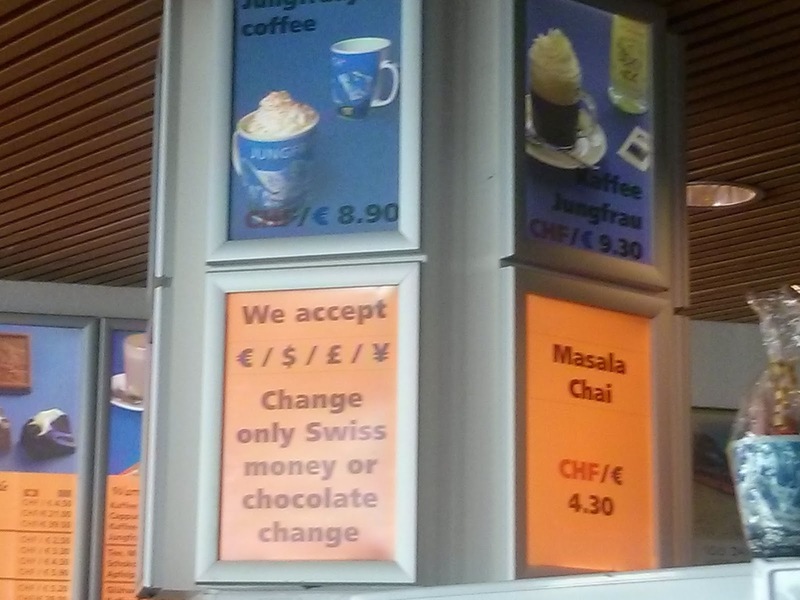 One visit to Jungfraujoch will set you back by about 205 CHF (or a little less if you have a Swiss Pass or if you go early morning when its slightly cheaper), it was in fact costlier than my round trip flight tickets to Switzerland. So its important to check the weather before you drag yourself up the mountain. The train stations are equipped with webcam and you will be able to see the webcam videos and get accurate weather information. 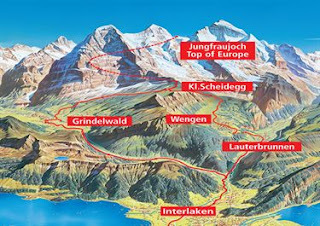 Depending where you are travelling from, you have to catch a train from Grindelweld, Lauterbrunnen or Wengen which takes you to ‘Klein Scheidegg’ railway station. ‘Klein Scheidegg’ is a place where one can spend a lot of time admiring the beauty of huge Eiger, Monch and offcourse the Jungfrau. At the KS station, look out for the sign Jungfraujoch either in yellow or green. Follow yellow queue if you have no seat reservation, otherwise follow green. 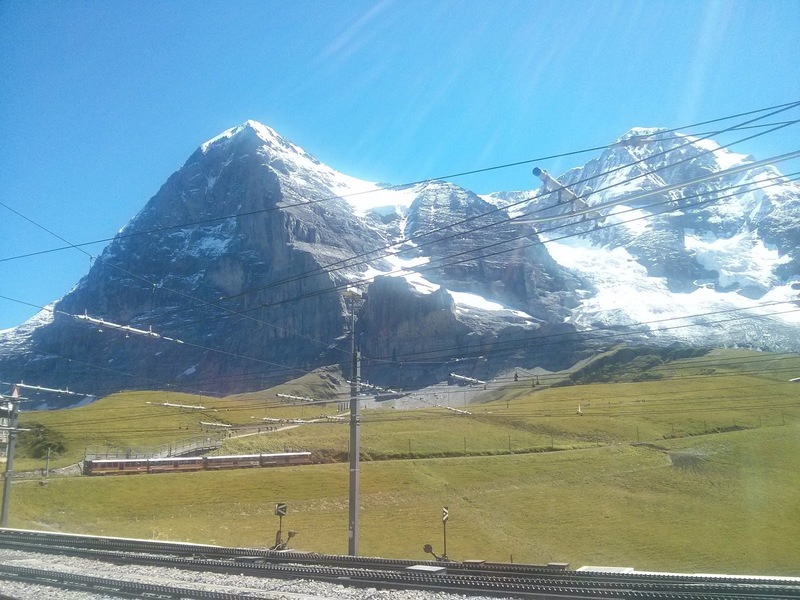 From here, you take the cogwheel train to ‘Jungfraujoch – The Top of Europe’ station. The cogwheel train rattles slowly up the incline in about 50 minutes and the entire journey is through tunnel inside Eiger mountain, its a marvellous Swiss engineering. There are three stations where trains stop for few minutes to allow passengers look down through the cutaway mountain glass window inside the tunnel. No one in our compartment seemed to be sure of this and when the train stopped on it's first stop, everyone seemed a bit confused. The husband, having done his thorough research and mostly in search of restroom, popped out of the train and others followed us. The view of the snowy fields below is just outstanding and leaves you amazed at how quickly you have made the accent, so dont miss this opportunity. 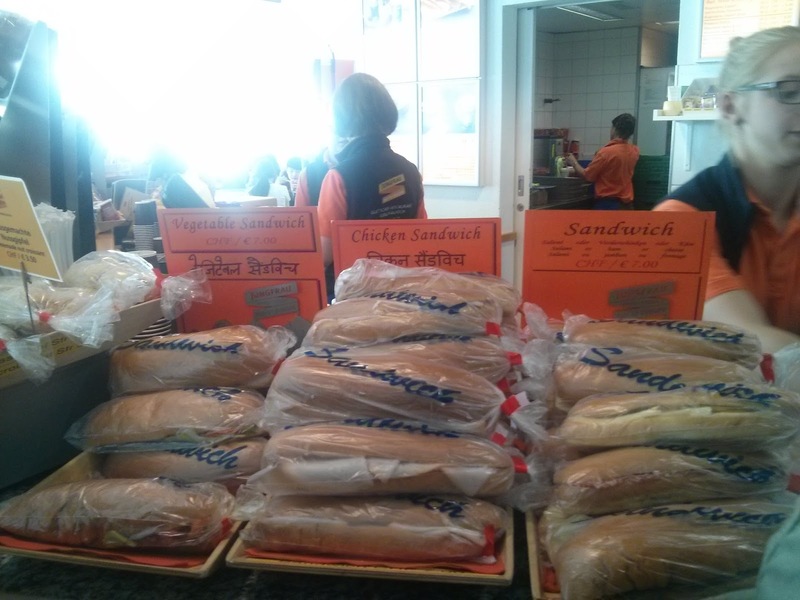 Once at the final stop, you are greeted with a 'Welcome' board in different languages, including in Hindi. The husband and I were starving so we decided to sit down and have some food before we went around the place. The food up there is average but expensive, but that did not come as a surprise. What surprised me was that there was a huge Indian restaurant aptly named as The Bollywood Restaurant (which was crammed with Indians from two or three tour companies). Outside, there were also some counters selling vegetarian & chicken sandwich with the name written in Devanagari script and also an overpriced cup of masala chai to keep the Indians warm in the freezing temperatures outside. We gobbled up the tasteless sandwich and also some chocolate and chips that we had carried and we were ready to go around following the tour sign. To start with, there is an elevator to go up to the Sphinx, the viewing platform over Europe. 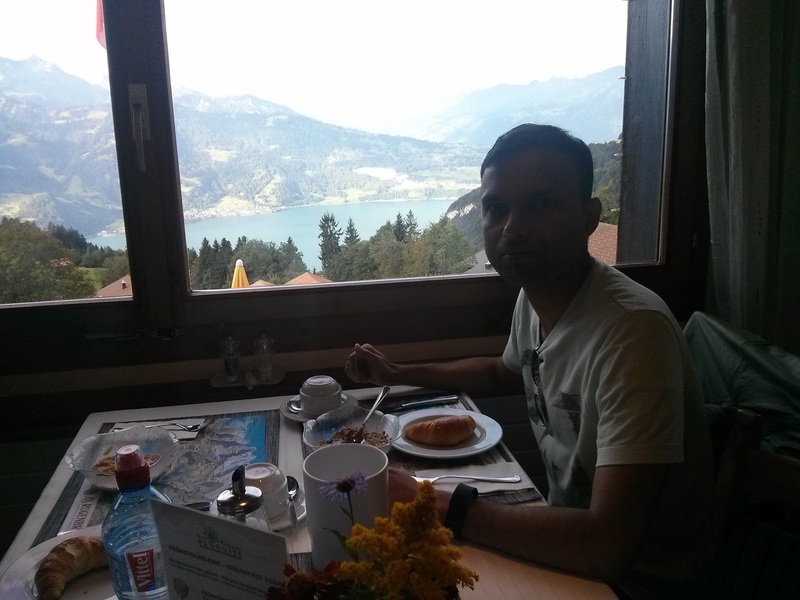 It was super crowded up there but nevertheless, the view of Jungfrau & Monch are stunning. It's strange to look down on an airplane flying below you through the valleys. The observation deck has been seen in Bollywood movies before, but what you see in movies was nothing as compared to experiencing it yourself. The air gets thin at the top so use your energy and oxygen wisely- don't get too excited and start ruining all over in the snow. Don’t forget you will be at 3454m and may feel slight altitude sickness although its hard to contain the fun of jumping and rolling down on the snow. It was quite crowded near the observation deck so we started walking towards Monchsjoch Hut. It's quite a long walk to the Hut - café, so we didn't go the whole way, but just enough to get away from the crowds. I wanted to dance to 'Zara sa jhoom lu mein' but the husband was getting quite embarrassed by my behaviour so I let it be. I tried to make a snowman which didn't look like one in the end. It can get cold there, so I suggest that you carry warm gear from thermals, sweaters, coats, ski hats and gloves. When we visited, it was a lovely sunny day and we took off our jackets and lied down soaking the beauty of the mighty Jungfrau in front of us. The other thing on the tour is the Lindt chocolate experience which we skipped. Then there is a Ice Palace which is quite nice, so dont miss it. Wander through a glacier with machine cut tunnels. See the very special Whiskey maturing in oak barrels, storeed in the ice for a quite unique flavour. Ice Age anyone? Do you remember the film and a frequent protagonist? Watch out for a cute and funny surprise.